It’s hard (if not impossible) to to fully identify with something we condemn, dislike or reject. And then there is the question if it is actually possible to identify with something that we recognize or someone that we like or feel pity for? Or is all this a delusion, a trick of the mind? When we identify with something or someone what actually happens is that we identify with our own thoughts or feelings about someone or something. It is pretty much asif you are identifying yourself with someone elses passport: it’s just an image, a piece of paper that seems to correspond with the real thing. The only difference is that the passport is an ID on paper and a mental image, ow words that we identify with happen in the mind. Both of them obviously never are the real deal. If the something or someone we seem to identify with can seem real but isn’t really real, how about the one that does the identifying? Does this ‘you’ consist of anything else than thought and feelings that seem to happen inside a body? What is it that does the identification? Is it a real person, or is the constantly changing process of identification appearing to be a constant person that we call me? And if so, can it be real? Identifying happens in the process of being. As soon as the light is on seeing happens. As soon as awareness is on and as soon as being is happening, identification is happening. The idea that there is a someone that could be free of identification is just another delusion. 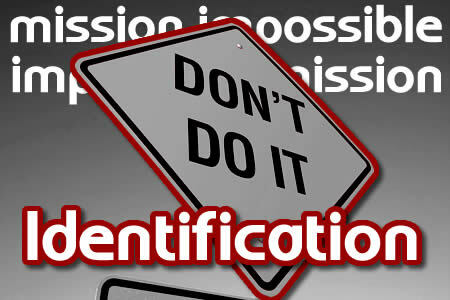 Firts of all the identification with someone that can be be deidentified is an identification by itself. Secondly: we are all identified as a point of focus: each and everyone of us is a unique point of entrance for awareness. This is where the flow of all other identifications seems to source from, it is where they begin. If we withdraw from all other identifications for this moment (or forever) we can go back to this point of focus. We might even go beyond it, empty-minded, but as soon as attention enters the realm of thought or the world that we live in this ‘source’ identification appears to be the most minimal identifcation possible. This point of entrance, this minimalistic and at the same time all-inclusive beginning point of experience is the starting point of a constant process of creation and identification. In fact we are not seperate from this constant process of experiencing and processing whatever is present. We are the continuity of whatever is flowing into this unique perception, the content of that flow, the way it is perceived and this unique point of view as well. And if we try to find that specific point of view it is impossible to locate it: It just is and at the same time it is unfindable as an object. Why? Beceause it is impossible to associate anything with it, it is empty of meaning. All we ever find when looking for this primal identifaction is such words, images, feelings, motions maybe, but not this not-a-thing itself. This is the unfindable identification that is present all of our life. It is how you know you are you and not somebody else. Anything that seems limiting about it is something that’s made up about it. It’s an add-on. You realize you are yet you cannot locate that realization. Ever. To identify is a beautiful verb that nobody can really do with something outside themselves and at the same time nobody cannot do with themselves.